Places to see in Kalipur: Tourists are truly attracted to the Medhla watchtower, from where they can catch the sight of wildlife. The watchtower is built adjacent to the Murti River. From the watchtower, you can also see herds of elephants crossing the river. You can also get a clear view of Mt. Kanchenjungha on a clear day from the watchtower. Visit the tea gardens and also try to arrange for a trip to one of the tea factory in the region. There is an abundance of wildlife in this National Park. So you can easily spot Gaurs, Barking Deers, Rhinos and Elephants near your bungalow. Leopards are also seen in the nearby tea gardens. The place is also ideal for the avid bird watchers for you can view a number of birds including, peacocks, serpent eagles, rufous treepies, bulbuls, drongos, black Ibis, greater pied hornbills and red jungle fowl in the Kalipur forest. The dance of the local tribal performed in the evening is also quite appreciable. Nearby attractions around Kalipur: You can make tours to Siliguri or Jalpaiguri from the location. Things to do in Kalipur: The elephant safari in the Gorumara Forest is a great entertainment for the tourists visiting the destination. You can also enjoy feeding the elephants and the local tribal programs in the evenings. How to reach Kalipur: It takes about 1.5 hours to reach Kalipur from Siliguri located in West Bengal. Tourists can also hire a car from the New Jalpaiguri Station. First drive to the Lataguri town and then look for a signboard with Kalipur written on it on the right side of the road. Kalipur is located on the opposite direction of the signboard. Drive for around 500 meters from that point and take the road on the left leading straight to Kalipur. The nearest railhead of Kalipur is located at New Jalpaiguri, which lies near to the Siliguri town. Moreover, most trains running to Guwahati, halt at New Jalpaiguri station. The Bagdogra airport located near Siliguri is the nearest airport of Kalipur. Hired cars are available at the airport carrying tourists to Kalipur. Best time to visit Kalipur: The ideal time of visiting Kalipur starts from the mid of October and extends up to the mid of March. The park remains closed during the rainy season (15th June – 15th September) and reopens around the mid of September. However, if you are travelling in October, you may experience occasional showers. 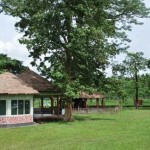 Lodging and dining facilities in Kalipur: Decent accommodation facilities are offered by the four Forest Department bungalows, built inside the national park. All the four bungalows are furnished with attached toilets, constructed in concrete stilts. Nice food is served in the bungalows.